As we just launched the Coviu API, people have come asking about getting screensharing to work from within Coviu sessions that are embedded into other Web pages as iframes via the Coviu API or the Professional account. 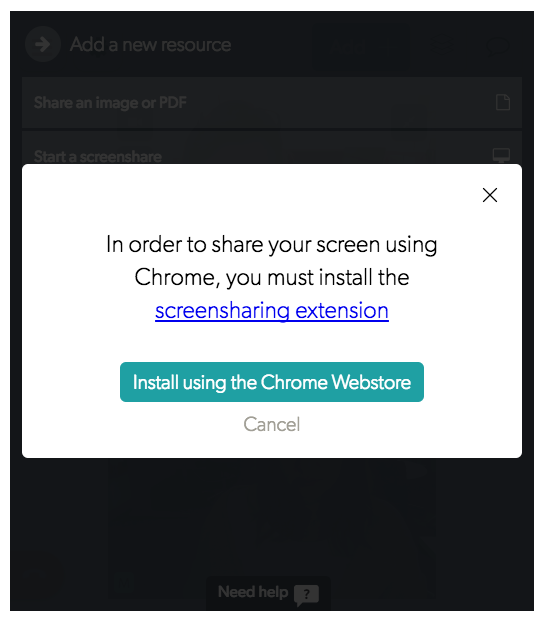 Firefox is quite lenient in that the screensharing extension will work as normal with one exception: it does not allow sharing of the whole desktop. So, choose a particular window or application that you want to share and you're set. Once you have installed this, Coviu will ask to install the Coviu screensharing extension. Just follow the link and install it. If it was already installed, this will update it. When the installation is done, return to this tab and click "cancel", then start the screenshare again. Now, updated plugins need new permissions and this might not be obvious. It will just continue to bring up the installation request, but there is nothing to update. Here's what you will see in your toolbar: a little orange exclamation mark. Click on it and give Coviu the new permissions and you're all set. Enjoy using Coviu sessions on your Website!